soft ground consisting of clay, fine sand and shells. This shifting soil destabilized the foundation stones, resulting inthe sinking and leaning that occurs to this day. Some places are just better equipped to support the weight and foundation of an entire building. 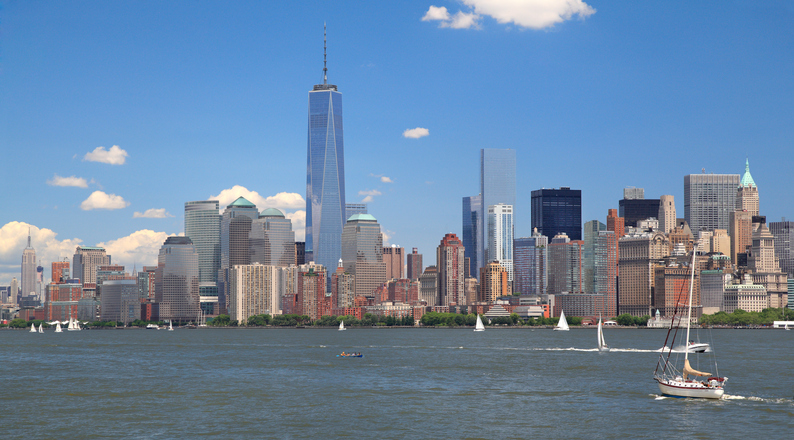 The city of Manhattan is supported by shallow, strong bedrock. 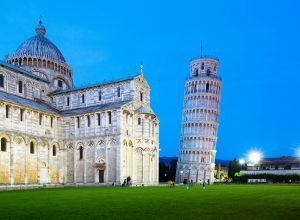 Unlike Pisa, towers and skyscrapers stand tall more easily because of the solid foundation. Most cities around the world aren’t fortunate enough to be seated on solid bedrock. Engineers have to make the best of the land they’re building on and create a strong foundation for each project. One of the most common ways to approach this dilemma is by simply building a better foundation. The most commonly used material for the job is concrete. 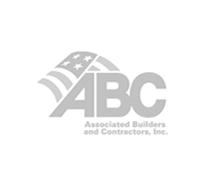 Poured concrete creates a solid base upon which a building’s foundation structure can be placed. Of course, it takes quite a bit of concrete to support a skyscraper. 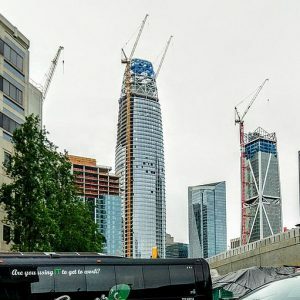 The concrete foundation supporting Salesforce Tower, a 970-foot tall building in San Francisco, is 14-feet thick and spread over almost an entire acre. Pouring the 49-million-pound concrete foundation took nearly 18 hours! 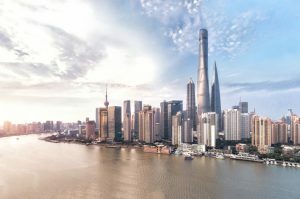 The Shanghai Tower and skyline. Many foundations are also supported through the use of piles, which are vertical structures that are driven into the ground. For large skyscrapers, the piles are normally used in conjunction with a concrete base. The Shanghai Tower in China is the world’s tallest building, judging by height to usable floor level, and stands 2,073 feet tall. Not only is Shanghai a popular zone for earthquakes, the site is located on a river delta that is filled with soft soil. To safely support the weight of the tower, engineers drove 980 foundation piles into the ground as deep as 282 feet. A 20-foot thick foundation was then poured over the piles using roughly 2.15-million-cubic-feet of reinforced concrete. 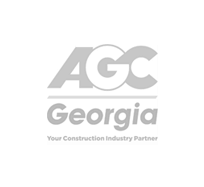 Atlas Piers of Atlanta is Georgia’s premier foundation repair and shoring company. 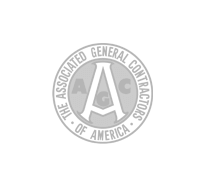 We’ve provided engineering solutions to residential and commercial projects for more than 25 years. In addition to installing both helical and resistance piers, Atlas offers underpinning, shoring, tiebacks and new construction services. 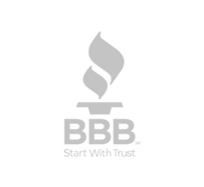 Contact us today for more information or to schedule an appointment.